Uploading large images to your site can significantly slow down your site. This is why we recommend users to always save images optimized for the web. However if you run a multi-author site, then it can be difficult to monitor images uploaded by other users. 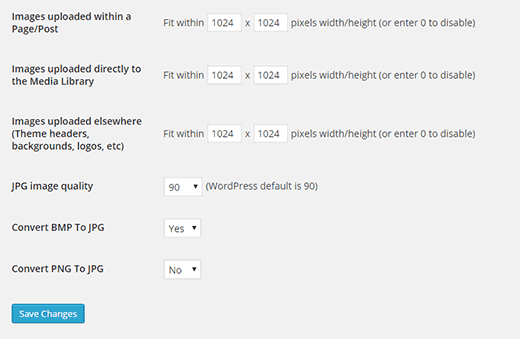 What if we told you that you can automatically resize large images on your WordPress site, even long after they are uploaded? 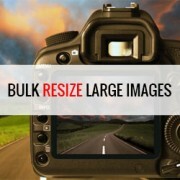 In this article, we will show you how to bulk resize large images in WordPress. Important: Please backup your WordPress site before bulk resizing images. Once resized, this action cannot be undone. First thing you need to do is install and activate the Imsanity plugin. Upon activation simply go to Settings » Imsanity to configure the plugin. The plugin allows you to choose the maximum image size for all images uploaded to a post/page, images uploaded directly to media library, and images uploaded for theme options. The default value is 1024 x 1024 pixels which you can change at any time. Below the image sizes, you have the options to choose image quality, convert BMP to JPG, and PNG to JPG. The default WordPress image quality for jpegs is 90, and setting it lower will result in loss of quality. Converting your BMP files to jpegs is always a good idea. However, converting PNG files to JPG does not always result well. Once you are done, press the save changes button to store your settings. On the same page, you will find a Search Images button at the bottom. 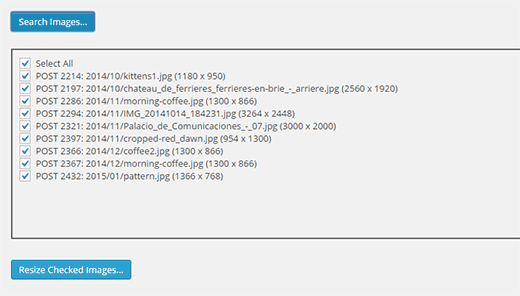 Click on it to locate files that are larger than maximum sizes you defined in your settings. The plugin will locate and display large images. Review the results and uncheck any images that you don’t want to resize. Once you are done, press the Resize Image Sizes button, and the plugin will start resizing images into the maximum values you entered in settings. It will also automatically replace large images with the normal sized ones. That’s all, we hope this article helped you bulk resize large images in WordPress. You may also want to take a look at Why you need a CDN for your WordPress blog. Does this plugin keep the aspect ratio? All I want to do is to resize images that are larger than 800px of width down to 800px of width without distorting them. So let’s say I have images that have 2400×1200 px -> should resize to 800×400 px while 1600x900px should be resized to 800x450px. Unfortunately, this plug-in doesn’t work with the current release of WP (4.5.2). If you check the support tab for this plug-in you’ll see several people report that it stopped working after version 4.5. Do you have an alternate recommendation? We tested the plugin on WordPress 4.5.2, it worked like it was supposed to. What problems you are having with the plugin? I’m working on a site that has a lot of images with several hundred blog posts. Turns out the author has just been uploading the original photos and using the WP editor to crop and ‘resize’ them. I’m fairly certain this still leaves the orignal uploaded file untouched, and now the site is very bloated, almost unmanagelable. Will this plugin retroactively remove large original images? Id love to know the answer to this too! Another longshot: can the source be a website address? So not the image but the home page of the site, returning a jpg for instance? Used this before and it is a great plugin. I had to do 1000’s of images and it worked great! Great article. Looks like an excellent plugin. I also read on about CDN’s and learned a lot. Thank you very much. I use Imsanity for all projects. For example: You have a 5 megapixel image, more than 5000px wide. You’re not going to need this wide of an image on your website. Just upload the image and Imsanity will resize the image (not crop) and save the resized image on your server and in your media library. This is also useful for when a theme is coded poorly, using the original image size to display on the website – We’ve all seen the super slow image loading on websites. Set “Uploaded to Media Library” and “Uploaded Elsewhere” to unlimited – This will give an easy to save the large images, if needed, as well as allow larger images for slideshows, background, headers, etc.